A subsurface depressurization system prevents vapor intrusion by directing hazardous vapors in the soil to the exterior of the building. Vapor intrusion occurs when vapors from volatile organic contamination in soil or ground water enter nearby buildings through cracks and holes in the foundations or slabs or via crawl spaces. In general, the goal at these sites is to remove the source of the vapors by cleaning up the contaminated soil or ground water. Since this can be a lengthy process, interim measures are often needed to protect occupants of the buildings from breathing the vapors while the cleanup is underway. An effective method to prevent vapor intrusion during the cleanup process is to install subsurface depressurization systems at the affected buildings. The two most common types are the sub-slab depressurization system and the sub-membrane depressurization system. 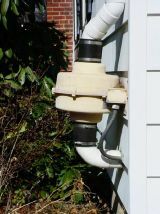 A subsurface depressurization system fan on the outside of a building. A sub-slab depressurization system consists of PVC piping installed through the slab floor and a fan connected with the piping. When the system is on, the fan applies a vacuum beneath the slab and the vapors in the soil beneath the building are directed outside, as shown above. With sub-membrane depressurization systems, an impermeable membrane (such as plastic sheeting) is placed over the earthen or gravel area and the ventilation piping is installed through the membrane. Subsurface depressurization systems are also used throughout the country to prevent naturally occurring radon gas from entering buildings. Sub-slab and sub-membrane depressurization systems must operate continuously to be effective. They use little electricity, are relatively quiet and require little maintenance. A professional contractor should periodically check your system to ensure it is working properly.